If your order weighs less than 13 ounces, save huge on shipping with USPS first class (with tracking number). This product weighs 4.9 oz. 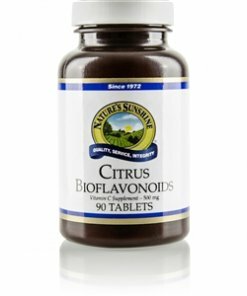 Nature’s Sunshine Vitamin C, Citrus Bioflavonoids provides protection from free radicals. 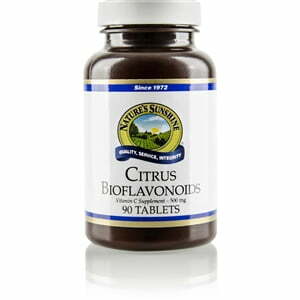 Bioflavonoids are natural compounds that contain vital nutrients. Vitamin C, Citrus Bioflavonoids blends 50 mg each of bioflavonoids from lemon, orange, grapefruit along with hesperidin complex, rutin, and rose hips extract. Each capsule, made with no starch, sugar, artificial flavors or colors, provides 835 percent of the daily value or 500 mg of Vitamin C.
Instructions: Take one or two tablets with a meal three times daily. Stearic acid (vegetable), magnesium stearate (vegetable), and cellulose (plant fiber).